We’re almost half year through 2015, would you believe it? Here are the best giveaways this month for online marketers, affiliates, designers and small biz owners. If you saw a giveaway that is not listed here, please leave a comment or contact us! Tim Ferriss Books – We are giving away 3 sets of Tim Ferriss’s 3 best sellers – The 4-Hour WorkWeek, The 4-Hour Body & The 4-Hour Chef. Enter here by June 2nd to win all 3! Apple Thunderbolt Display – Designfrix with a cool giveaway – enter here by May 27. Who doesn’t want one on his work desk? Get Noticed! Theme – John Meese is giving away a Get Noticed! Theme package worth $700. The theme designed by Michael Hyatt’s team. Enter here by May 22nd. 1400 HQ SmashIcons – Enter on eWebDesign blog here by May 20 to win this huge pack of high quality icons. Fedora – Fedora is an online platform to create and sell your courses ( a Udemy contestant). Enter their giveaway here by May 18th to win over $5000 worth of course creation assistance and equipment. Dessign – DesignBolts blog is hosting two giveaways this month. One of them is this pack of 100+ themes by Dessign. Enter here by May 17th. 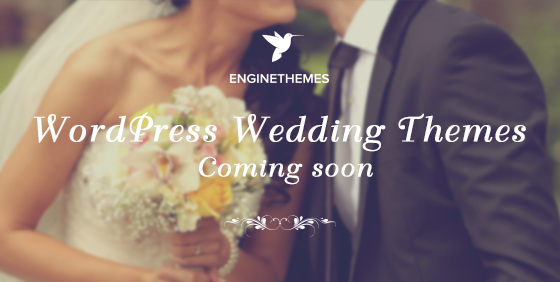 WeddingEngine – EngineThemes are launching a new wedding theme – WeddingEngine (original, right?). But, jokes aside, it’s a pretty neat theme, if you have clients in the wedding (or events) niche, it’s something to consider. Till May 12th they are giving away one license each day. Enter here! Blog Design Package – If you’re starting a new blog, or just looking for a re-design, try this pre-made blog design package by White Oaks Creative, valued at $250. Enter here by May 10. Crocoblock – On their 2nd giveaway DesignBolts are giving away 4 packages of access to all 118 Crocoblock themes, enter here by May 6th. Ptengine Heatmap/Analytics WP Plugin – Ends early into this month, this new heatmap service has 6 premium licenses for you. Check the WP Daily Themes blog here by May 2nd. I have started a giveaway of PixelKit. com memebership. can you add my giveaway to this list?